St. Patrick’s Day is one of the famous holidays in Ireland and around the globe. This day is also a special day to show your love of the color green, merriment, booze, meat and a lot more. On this day, you can also give gifts like any other holidays. Show your thoughtfulness and sense of humor with these Funny T-Shirts for Women that would bring the big grin in her small chin. We have gathered the top seven funny shirts for her that would tickle your funny bones. The tricky and sneaky leprechaun since the beginning of time is known to be small about a size of a child but there’s always an exception in any rule. This high quality shirt is super soft and light weight. A versatile piece of clothing that can be worn to work or at play or match up with a sweater or blazer for night outs. It comes with several colors to choose from. For only a little over than 30$ for the green tee which is the color of St. Patrick’s Day, anyone who would wear would feel comfortable and would not be pinched of course. 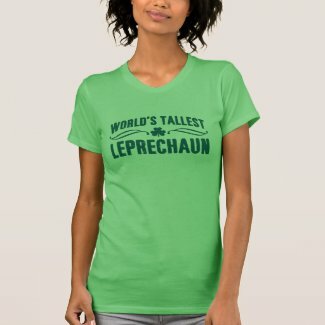 You may also give this shirt to a friend who is not that lucky to be tall but is lucky to be tallest among the leprechauns. It comes with various sizes to choose from Adult Small to Adult double extra large. The sizes run small so better choose a size that is one or two sizes bigger than the usual size. You can also customize the location of the print or the size of the font. This three fourth sleeve classic baseball jersey styled tee is perfect for your light of the party friend. St. Paddy’s Day is known for oozing green booze and green whiskey day. To celebrate this bottomless day with more fun, flaunt your awesomeness with this tee. Aside from being cute and timely, this t-shirt is very comfortable to wear and is cut just for women. It is made from a hundred percent soft ring spun cotton and it has side seams that are double needle stitched on the sleeves and at the bottom part of the shirt to withstand the test of time. The print and the caricature can be customized as you please with a variety of colors to choose from. 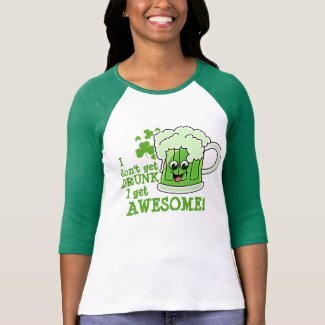 For less than 24$ party animal can brag about her awesomeness on St. Patrick’s Day. Sizes run from Adult Small to Adult double extra large but sizes are smaller than the standard fit so you better add one to two sizes to be snugly fit. The basic shirt never looked better especially when the print is timely and funny. This shirt is for the beer lover friend who enjoys herself in parties and night outs. It comes with various colors to choose from but green would be best suited on St. Patrick’s Day. The shirt is so comfortable that you would want to wear it every day. The design and print are customizable so feel free to alter. For a little less than 35$, you’ll get your money’s worth. It has the quality, comfort and style in one. It also comes in variety of sizes but it may be smaller than the standard. Ahoy! Everyone wants to be lucky on St. Patrick’s Day. Be loud and proud that you are the lucky charm. The vintage design on this tee makes it look dramatic. It is one of the best selling tees of American Apparel because of its versatility and comfort. This tee can be worn anywhere and at any time of the day. There are a lot of colors to choose from and the print can be enlarged or refined as you want. For less than 34$ you would definitely get value for your money. There are sizes to choose from but better pick a bigger size to be sure that it would fit you properly. To be lucky on St. Patrick’s Day, legends say that you need to kiss the Blarney stone. Anyone who kisses this stone would get the gift of persuasive eloquence or to speak sweetly and convincingly. It’s quite difficult to reach the stone so why not kiss someone who has kissed it before? Makes sense right? This three fourths t-shirt is very comfortable and is designed in the silhouette of a woman so you wouldn’t be boyish like when you wear it. 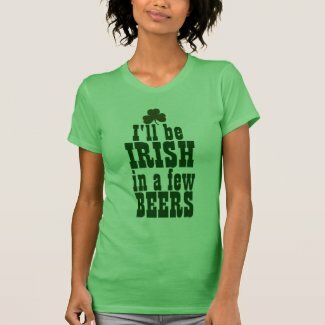 Celebrate St. Patrick’s Day in style with this high quality t-shirt from Bella for only less than 23$. There are plenty of colors to choose from as well as the sizes. Be merry, party and celebrate St. Paddy’s Day wearing this tee. Who knows, you might be kissed too. On St. Patrick’s Day, green beer and green whiskey seem to be bottomless and kept on flowing and flowing. It is believed that there is no better place to celebrate St. Paddy’s Day than at an Irish Pub but since this holiday has become a global phenomenon then you can drink your heart out almost anywhere. Emerald Isle, Irish whiskies, Guiness to green cocktails and a lot more, drinkers gulp like a fish to celebrate the Irish pride. Celebrate the festivity by imploring humour as you quote you can’t drink all day if you don’t start in the morning. It is totally true and sickly hilarious right? This classic baseball jersey cut for the ladies fit is proudly made by Bella. It is ultra soft and extra durable because of its double stitched hems on the sleeves and at the bottom. With a variety of colors and sizes to choose from, you could never go wrong. With a sweet tag of less than 24$, it would be a win-win for everyone. The print and design are both alterable upon order so you could make your own in a unique way as you please. Bella’s one hundred percent soft spun cotton shirt is super duper comfortable and is especially cut for women. 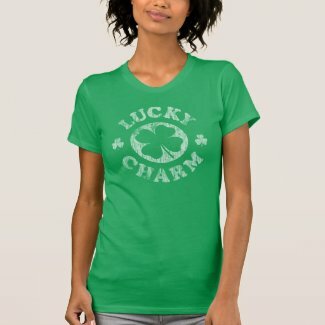 This tee has the print touch my lucky charms and I’ll choke your little leprechaun is great for strong and straightforward women. Stand out, be proud and be in style as this three fourth sleeved t-shirt hug your figure as worn. There are plenty of colors and sizes to choose from, so you could definitely pick out the best one for you or your recipient. The quality and style is not compromised by its cheap price of only less than 24$.